Note: Nature’s Promise Organic items are available at Stop n Shop. Lightly spray the cooking sheet with Nature’s Promise Olive Oil Spray. In a small mixing bowl, mix the diced red skin potatoes, 1 tbsp olive oil, & 1 tbsp minced thyme, & place evenly on the baking sheet. Place in oven & roast the 4 diced red skin potatoes for 30 minutes, or until golden. While the potatoes are roasting, lightly spray the skillet with Nature’s Promise Olive Oil Spray, & place on the stove at a medium temperature. Cook the 4 strips of Nature’s Promise Uncured Maple Turkey Bacon in the skillet for 3 minutes on each side. Let the bacon cool, and cut into 1/2 inch pieces. In a large mixing bowl, mix the 6 large brown eggs, 1/2 cup egg whites, 1 cup chopped organic baby leaf spinach, 4 diced scallions, the cut bacon, 2 tbsp unsweetened almond milk, & a 1/4 cup shaved Parmesan. Remove the potatoes from the oven, & add them to the large mixing bowl, & thoroughly whisk the mixture one more time. Lightly spray the medium square glassware dish with Nature’s Promise Olive Oil Spray, & add the mixture to the dish. Bake for 25-30 minutes, or until cooked through, & turn the oven off. Top with the additional 1/4 cup shaved Parmesan, & leave in the oven for an additional 2 minutes to allow the Parmesan to melt. Remove from oven, & allow to cool for 1 minute, & then serve. This recipe may be used for Meals 1, 2, or 3 on the Remedy Recipes format. 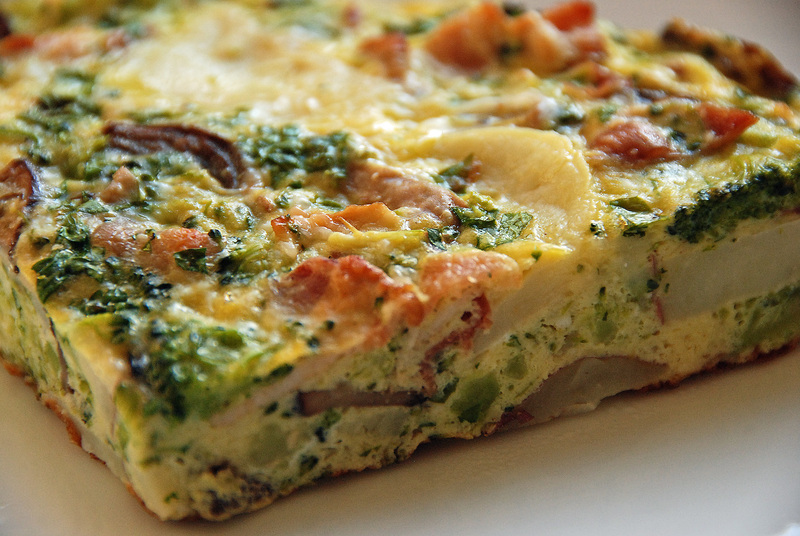 It’s a great one for Mother’s Day breakfasts or brunches! It’s also a great way to make a few breakfasts for the week! We hope that you enjoy this delicious recipe, full of tasty, fresh ingredients! Happy Mother’s Day to all the mothers & grandmothers out there!